Regardless of where this high-quality black steatite material originated, I believe it is safe to say it was not from south-central Georgia. This opens up several questions that will be addressed in much detail later in this article, but for now, our second clue is the handled platform style. Although many different cultures created excellent steatite pipes, mostly platform varieties, the pipes created by the post-Hopewell and Late Woodland culture, known as the Intrusive Mound, represent some of the highest quality. 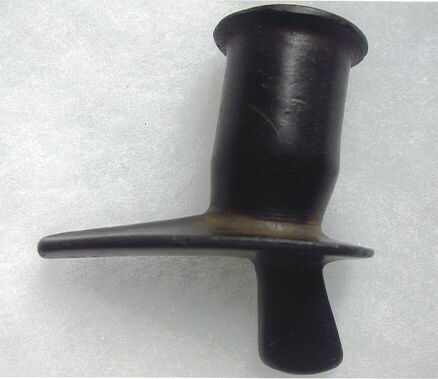 "The Intrusive Mound people modified the 'monitor' style of Hopewell pipe by creating an elbow style with a short frontal projection, thin walled, highly developed spool shaped bowl and flat base stem. Almost exclusively, the 'Intrusive' people preferred the use of blackish-green steatite, a material ignored by the Hopewell. "(1,4) "The classic pipes of the Intrusive Mound culture from the east coast are to what is now western Indiana and from North Carolina north into Canada were darker hues of steatite. "(1,5) Typical characteristics identified as Intrusive Mound style are (A) straight-based platform style; (B) with a ridge above the drilled stem hole; (C) a spool-shaped bowl; (D) tally marks around both the platform near the base of the bowl and on the rim of the bowl, all of which are present on this pipe. Based on this, it is my theory that this pipe is representative of the Late Woodland period Intrusive Mound culture. In order to verify my hypothesis, I shared the pipe with several individuals that I consider knowledgeable in the area and asked them for their opinions without injecting mine. I flew out to California (on business) and asked Bill Jackson for his opinion. After looking closely at the pipe, Mr. Jackson, stated, "This is one of the finest artifacts I have seen in a long time." He provided a Certificate of Authenticity, (CoA) identifying it as from the Late Woodland period. I then flew to Oklahoma to share the pipe with Mr. Gregory Perino. He gave his opinion, "This is a dandy...post Hopewell, Late Woodland." He also provided a Certificate of Authenticity (CoA). 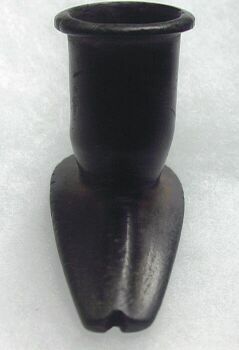 Later, Chad Childs, President of the Peach State Archaeological Society of Georgia, said, "I think this is from the Intrusive Mound Culture and is a very rare find." Mr. Cliff Jackson from North Carolina stated, "They are sometimes associated with the Intrusive Mound people. These are rare pieces found predominantly in North Carolina and Virginia to my knowledge. There seems to be a range of dates for it. I'll enter my guess that it might be from the Early Woodland period, though it probably came later made by the ancestors of the Creek/Cherokee. By that time, the trade networks were in place and moved raw materials and finished goods, like beads and mica." Gary McDaniel of Alabama said, "This is one of the nicest and most unusual pipes I have ever held." Roy Capps from Oklahoma called the pipe "museum quality." Not that it takes much encouragement, but with this level of support, I was definitely motivated to continue my research. I am focusing on the two following sites, both for the proximity to the location where this pipe was found and the Late Woodland cultures who occupied the sites and the surrounding vicinity for this analysis. The Ocmulgee Indian Mounds National Monument, located in Macon, Bibb County, Georgia, on the Macon Plateau, "were constructed between 1150-1100 BP. Over the next 300 years the mound-builders inhabited this site, considered to be one of largest village in the Southeast. "(7) However, of considerable interest is the Swift Creek site (9B13), located approximately six kilometers southeast of Macon Plateau, which represents the first pre-Mississippian Mound-Builder culture identified in Georgia. (8) This Woodland culture was named for the mound and village site, Swift Creek. The Swift Creek culture occupied the Ocmulgee region as well as several other sites throughout Georgia during the Late Woodland period. 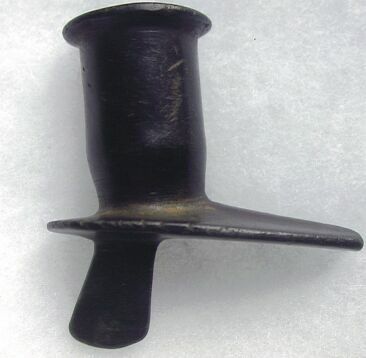 My theory is that this steatite handled platform pipe was an item of trade between the Intrusive Mound people from the north and most likely the Swift Creek (possibly the Weeden Island people) of Georgia during the Late Woodland time period. Regardless of whether or not this theory is believable, one thing is certain: this pipe certainly represents a time and a people who took great pride in creating truly spectacular works of art. There is a small surface scratch caused by a plow strike, and there are clearly teeth marks visible on the stem from use in Late Woodland times. Both the bowl rim and platform edge exhibit tally marks systematically engraved to form a pattern. The following provenience on this pipe is provided. Jasper Marion Martin kept this pipe throughout his childhood after finding it in the 1910s on a farm near Fitzgerald in Ben Hill County, Georgia. When he moved to Boaz, Alabama in 1931, he left the pipe with his brother Howard, who remained in the Fitzgerald vicinity. Howard kept the pipe until 1967. When he was offered $400 by a collector for what he called an "Indian Chief's Nose Warmer Pipe," Howard decided he had better give it back to Jasper if it was worth that much money. Jasper put it in his dresser drawer, where it remained until he passed away in 1978. At that point, Dona Martin inherited the pipe from her father. Dona Martin (now Ayers) decided to place it in a safe deposit box, where it stayed until 2003. During a conversation, Aunt Dona (my wife Susan's aunt) mentioned she had an "Indian Chief's Nose Warmer Pipe." Although I had no idea what a nose warmer was, like any true artifact collector, I was interested to see exactly what she had. The next time I visited Dona, she had this pipe lying out on a shelf, at which point she suggested the pipe should be displayed rather than sit in a safe deposit box and asked me to add it to my collection and share it with people who would appreciate such a fine artifact. This family heirloom has now been passed through three generations since it resurfaced 90 years ago, and it sits proudly as the centerpiece of my artifact collection. Dona Martin Ayers for allowing me to share this pipe. Bill Jackson, personal communication, CoA provided. Gregory Perino, personal communication, CoA provided. 1999 Collectors Guide to Indian Pipes Identification and Values. 1890 The Antiquities of Tennessee, pg. 179. 1983 Artifacts, Vol.13, No.4, Pg. 89 "The Steatite Platform Pipe Family." 1988 Prehistoric Artifacts, Vol.22, No.4, Pg.27-28. "The Art of Pipe Collecting and Preservation." 1975 The Redskin, Vol.10, No.1, pg.3, "Kenneth O. Palmer Pipe No.1." 1997 Hopewell Culture National Historic Park Chillicothe Ohio. National Park Service. 1946 American Antiquities, Vol. 4. Reservation, Chattachoochee County, Georgia. National Park Service.